Back from my break over the holidays! Back to work, son is back to school. I didn't publish any articles over the break, but that doesn't mean I wasn't working on one! Back in January, 2010 (7 years ago now), I published an article on my frustration around Intuit's Quicken product, and specifically the lack of support for the Macintosh platform. The article got a lot of publicity and I ended up writing a series of articles on the state of Macintosh Financial Management software. The most recent article on the topic was published in February, 2011 and discussed my final decision: Quicken for Mac was dead and I moved to iBank (now called Banktivity). Well, it's now 6 years that I've been using iBank for all of my Financial Management and really, nothing changed. Until it did...more to come soon! I've tried to group Audio, Social, Mapping, and Messaging together so I can get to them quickly. I obviously still have two spots to fill, which surprised me, so the organization isn't perfect. You'll also notice I still have a folder...the issue is that I do a lot of Home Automation and, in today's world, that's a lot of apps. 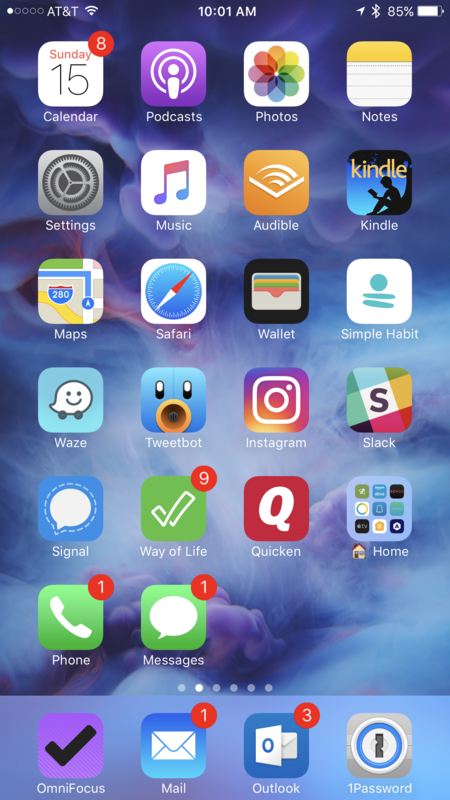 They all get used relatively frequently (Ecobee, Alexa, Sonos, SmartThings, Ring, Harmony, Apple TV, Home, Automatic, and others), but there is no central application, so I decided to make an exception and leave my "Home" folder on the Home Screen. It was an interesting exercise and is obviously still going on. My wife also started her MBA, so proud of her!